An area or region drained by a river, river system, or other bodies of water. It is well known that the Columbia River takes its name from the boat captained by Robert Gray, who first sailed up the river in 1792. It is less appreciated that the full name of the eponymous ship was Columbia Rediviva, “Columbia Revived”. It is likely that Rediviva refers to a retrofit of the original Columbia, an upgrade requisite to it becoming the first U.S. ship to circumnavigate the globe. Both because of its length and as a proxy for the fabled Northwest Passage, the Columbia became a gateway to the continent, the “River of the West”. As such, its name was bestowed on the surrounding region, a drainage area the size of France reaching from coastal temperate forests to the spine of the Canadian Rockies and down to inland deserts. Columbia Rediviva is both trivia and symbol, past and prologue – suggesting a reconditioning of our river, and our region, will serve us better on the journey ahead. In that spirit, we launch this initiative to take a fresh look at the Columbia– its literal and figurative power structures, its salmon, its water, and its regional economy. 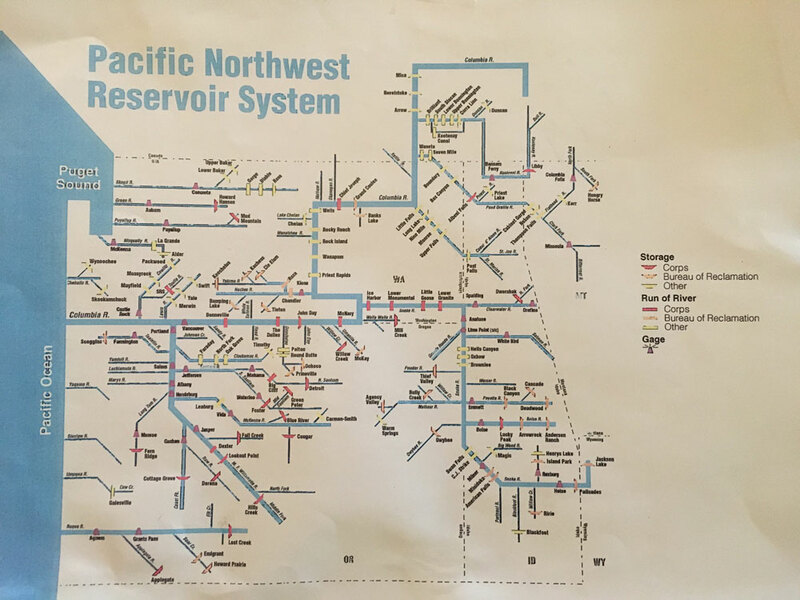 Updating our 19th Century operating framework to align with our 21st Century understanding of two energy systems on the Columbia River - one electrical and one biological - will result in the largest river restoration project in U.S. history, a robust and distributed power grid, and a fundamental reshaping of our relationship to the natural world. Translating a 3-dimensional world onto a 2-dimensional plane has always challenged cartographers to choose among different representations - appropriately called “projections” – that serve the map’s intended uses, the map-maker’s perspective. Similarly, we express our varied self-interests upon physical landscapes and watersheds, interpreting and transforming them according to our purposes. The distinction between real and projected features is not as clear as we might think – a map is not separate from society’s aspirations as much as an expression of them, both reflecting and shaping our field of view and the stories we tell. Columbia Rediviva must, therefore, begin with a picture of the Columbia itself, exhumed from the overburden of development and expectations, vasculature of an eco-shed reaching from the continental shelf to the continental divide. From here, we can examine legacy commitments and forward intentions in the context of our current understanding of the place and what it can provide. By contrast, almost all current representations of the Columbia focus attention on some aspect of its mechanization - the river primarily in service to electricity generation, for example, as seen here by the Army Corps of Engineers. If maps are a kind of story we tell ourselves about a place, and how we intend to interact with it, loyalty to a story irrespective of how it fits with our evolving understanding can have disastrous results. The military-industrial vision of the Columbia as a network of plumbing was realized long ago but the collateral damage continues, attended by a vibrant rationalizing mythology. Fortunately, stories can be updated; maps can be re-drawn. Arrangements that no longer serve us well can be deconstructed, the future allowed to flow. 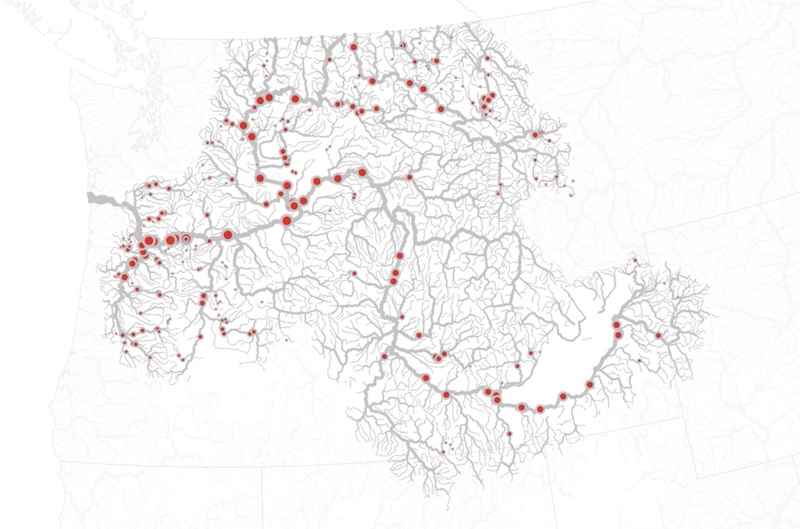 Over 400 dams impound the Columbia and its tributaries, the most hydroelectrically engineered river system on Earth. 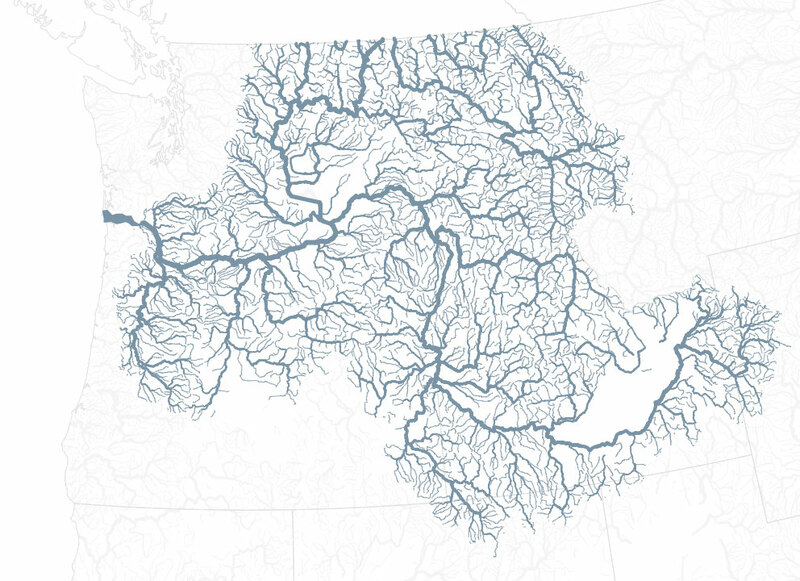 Water flows freely for a little over 50 miles of the non-tidal Columbia’s 745-mile length in the United States. 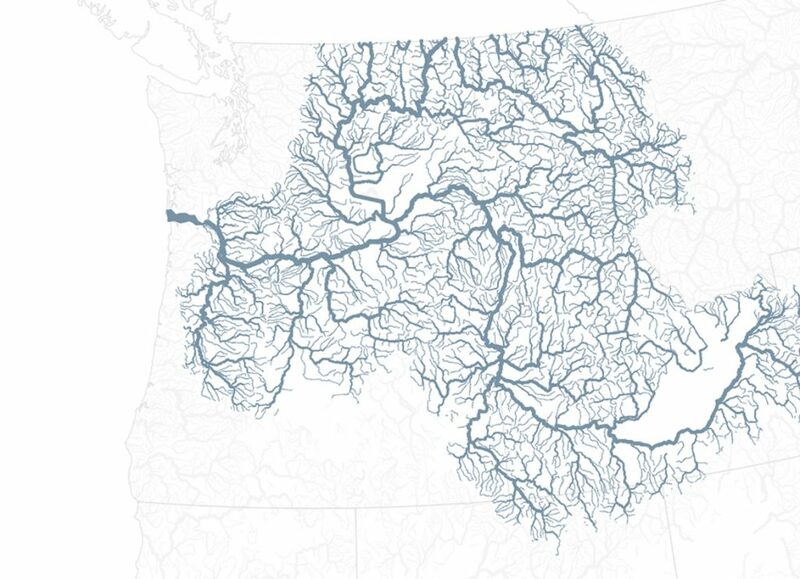 Only two of its major tributaries - the John Day river in Oregon and the Salmon River in Idaho - remain undammed. The river has been almost completely abstracted; water released for purposes other than mechanical work is referred to as “spill”, suggesting such events are both accidental and temporary. Bonneville Power Administration (BPA) is a non-profit, tri-partite federal agency within the Department of Energy. BPA was a New Deal response to the challenges of rural electrification in the mid-1930s when less than half of Washington farmers and less than one-third of Oregon and Idaho farmers connected to the grid. Bonneville markets power from 31 dams constructed by the federal government and operated by the Army Corps of Engineers and the Bureau of Reclamation, covering its costs through electricity sales and related services. 80 years later, the story has changed. BPA’s financial condition is challenged by rising operation and maintenance costs at the aged dams, payments on $17 billion of debt, declining cash reserves, and plunging prices for wind and solar electricity. Several of the public utilities are reconsidering their long-term contracts for BPA’s power as the government-run, centralized generation and transmission business model seems uncertain. 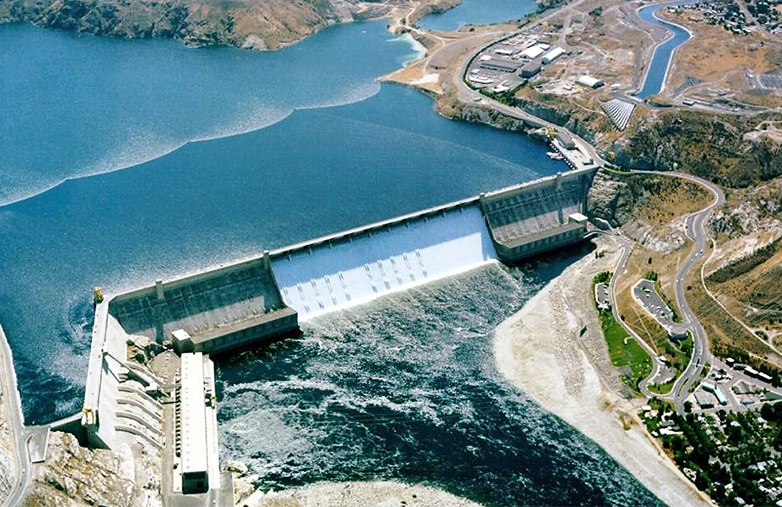 At the same time, BPA is legally responsible for mitigating the effects of the dams - what has become the most expensive ecological recovery project in U.S. history. The Columbia River was once one of the world’s most productive salmon systems. Annual runs of 10–30 million fish, up to 50% of which originated in the Snake River and its tributaries, were defining events for all manner of life in the Pacific Northwest. Now, their absence shapes the region. 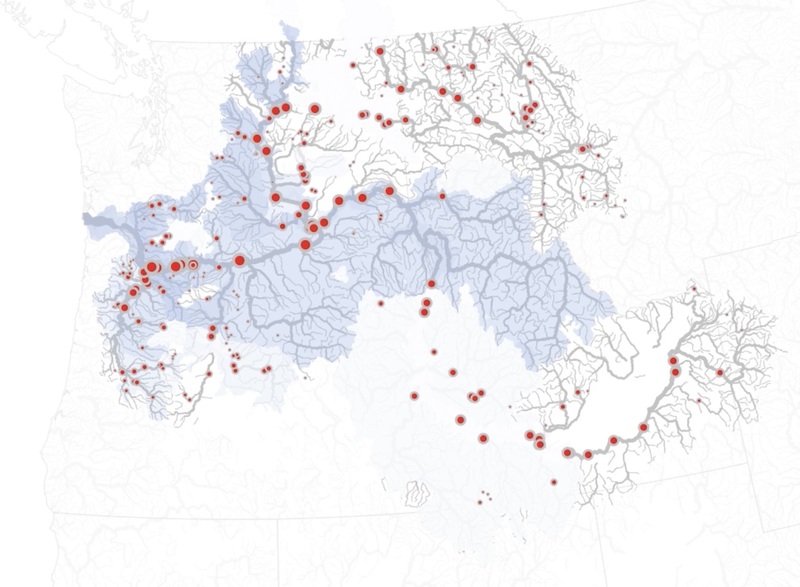 Many Columbia River Basin salmon populations are already extinct; of those remaining, thirteen are endangered and have access to less than half of their former range in the Columbia and its tributaries. Salmon migrating between the ocean and the last best habitat remaining - nearly 6,000 miles of high-elevation, cold-water streams emerging from central Idaho’s wilderness - must navigate a gauntlet of 8 large dams and their torpid reservoirs. In 2015, 99% of returning Snake River sockeye, the Columbia basin’s most endangered salmon, died when water behind the dams rose to lethal temperatures – a harbinger of warming trends on rivers everywhere. We have broken the connection between the mountains and the sea. 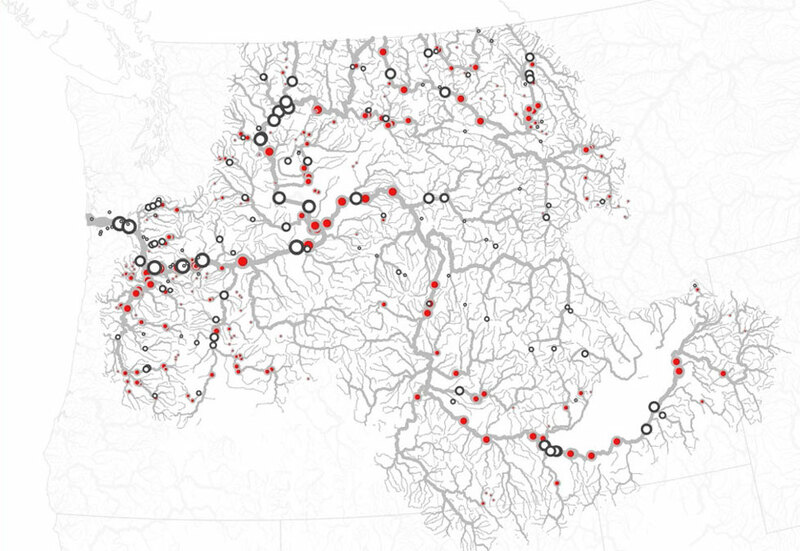 As early as the late 1800s, fisheries managers desperately attempted to mitigate these fragmenting effects of human activity on western watersheds. One possible answer to the problem arrived in the United States from Europe, where experiments in fish propagation celebrated the potential for mass production of various species, including salmonids. The concept and methodology of hatcheries – a kind of fish factory - fit perfectly with an industrializing nation, offering a way beyond the inconvenient constraints of protection with the promise of production. Protection through production. There was no real evidence the idea would work, little apparent consideration what would happen if it didn’t, and it relied entirely on the presumption that extraordinary abundance existed in spite of nature’s variability, not because of it. Yet there was little hesitation. In response to evidence that careless development of river systems was killing the fish, well intentioned people started removing the fish from the river; and salmon have literally been in our hands ever since. 150 years later, the blueprint of our intervention has become the scaffolding of our failure – a monstrous suite of creative, expensive, but ultimately ineffective alternatives to salmon swimming up and downstream. We supplant traditional cycles of reproduction and death by raising them in concrete tanks, piping them from reservoirs behind dams, implanting them with tracking devices, transporting them in trucks, feeding them in offshore pens, harassing and killing their natural predators, harvesting them in labs. About 8 in 10 Columbia basin salmon begin and end their life in hatcheries instead of spawning naturally in the wild. 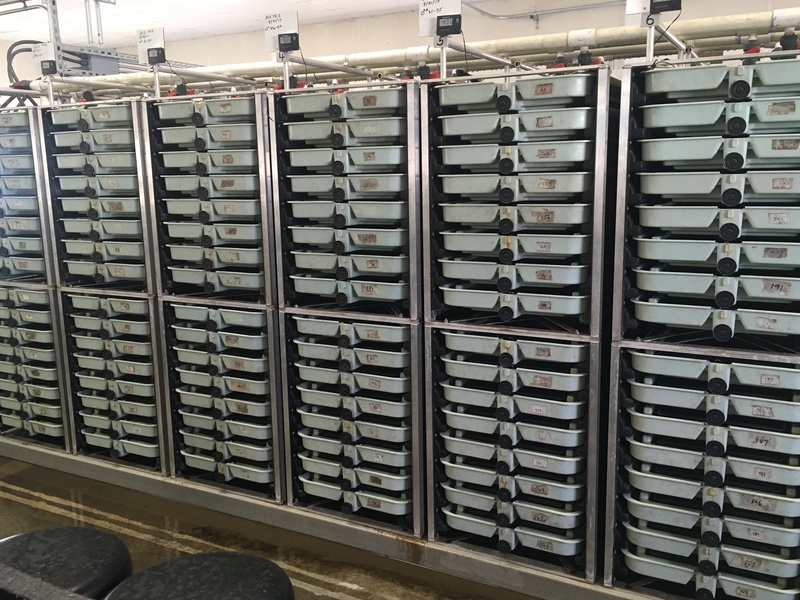 Over 170 hatchery programs mass-produce about 150 million juvenile salmon for release annually. In the last 30 years, more than 4.6 billion juvenile salmon have been released in the Columbia and its tributaries and federal agencies have spent more than $15 billion on endangered salmon recovery. Despite this investment, the agro-industrial model of recovery has never worked. 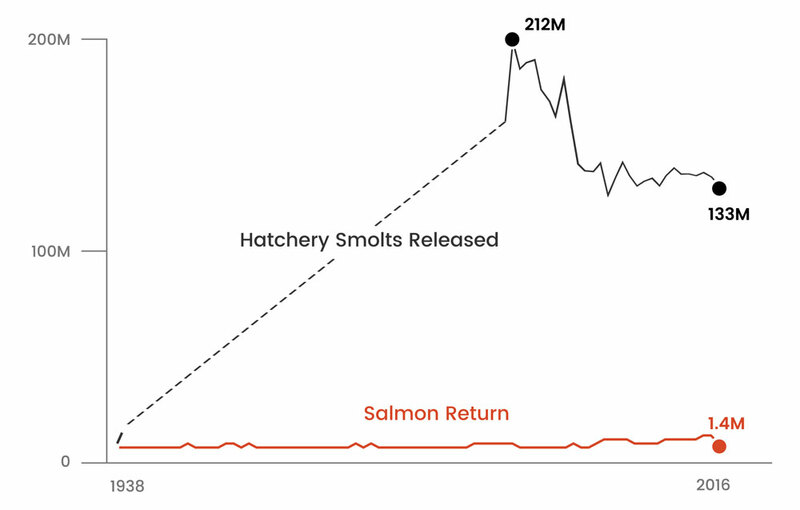 Only about 0.5%-1.5% of hatchery-produced salmon return as adults, far short of the 3-5% adult survival necessary just to maintain populations, much less rebuild them. 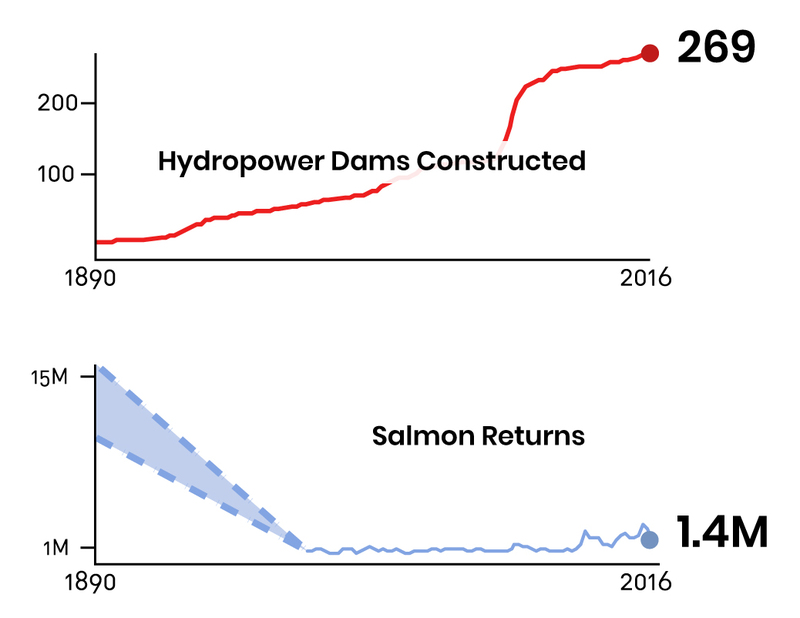 In the meantime, wild salmon numbers have declined over 95%, not a single listed salmon run has been recovered, and a growing portfolio of research enumerates the deleterious effects of hatchery fish on wild populations. What was once free, regenerative, and abundant is now exorbitantly expensive, dependent, and endangered. It is a daring approach to conservation based on a 19th Century understanding of the world, whose achievement could mean we have salmon without rivers, and whose failure would leave us rivers without salmon. Do we win either way?